There’s a new Lush shower cream out! Having used up the remainder of the numerous bottles of Snow Fairy that I purchased last December, I was on the look out for something that smelled equally as amazing. If you have never heard of or tried Snow Fairy, it is one of Lush’s cult items that they only bring out during the Winter months. It smells amazing, just like bubble gum/candy floss and its thick consistency makes it lather really well. 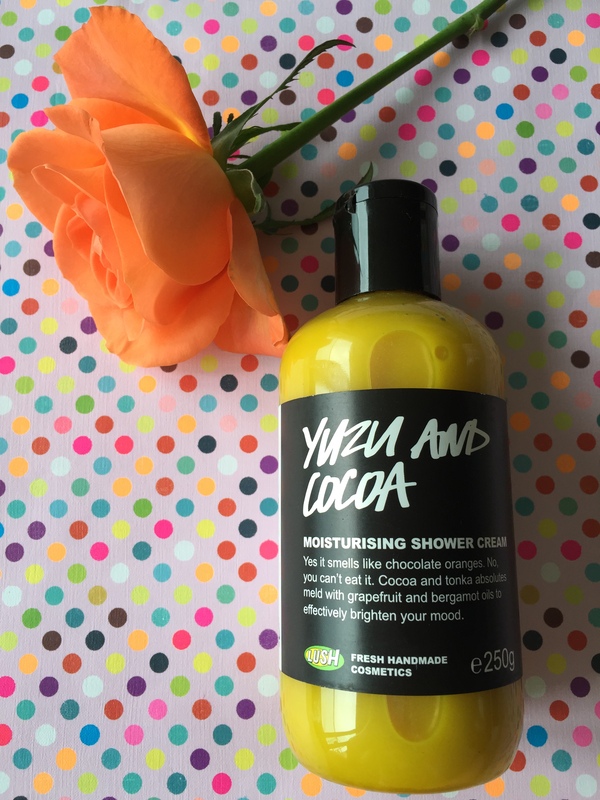 I popped into my local Lush at the weekend and the girl mentioned that the Yuzu and Cocoa Shower Cream was new instore. I just had to try it from the smell alone, which is delicious! It’s just like chocolate orange, although a bit more on the orangey citrus side. The colour is bright yellow and when showering your skin looks as though it is turning yellow, like a cartoon character however this washes off so don’t be alarmed. The ingredients of this product are Yuzu juice, cocoa butter, grapefruit oil and bergamot oils. The combination of this formula is highly moisturising and the fragrance will definitely brighten your mood. A good pick me up for mornings or after a gruelling work out in the gym. The only downside I found was that it doesn’t lather very well and is a quite watery/thin consistency. I thought that it would have been thicker although maybe it was just the one that I had picked up. £4.75 for 100g, £9.50 for 250g, £15.95 for 500g, £27.50 for 1kg. Have you tried any of the shower products in Lush? I would love to hear if you have, and if you would recommend another item that I should try next! I need to try some lush products! They seem so good! I wish we had Lush in Greece… 🙂 P.s. great post!! oh wow this looks awesome- i’ll have to get some!